The building originally on this site was a frame grocery store owned by Matthew Norton. It was moved behind the present building in about 1870 when the present structure was built by Silas Randall as an agricultural implements store. 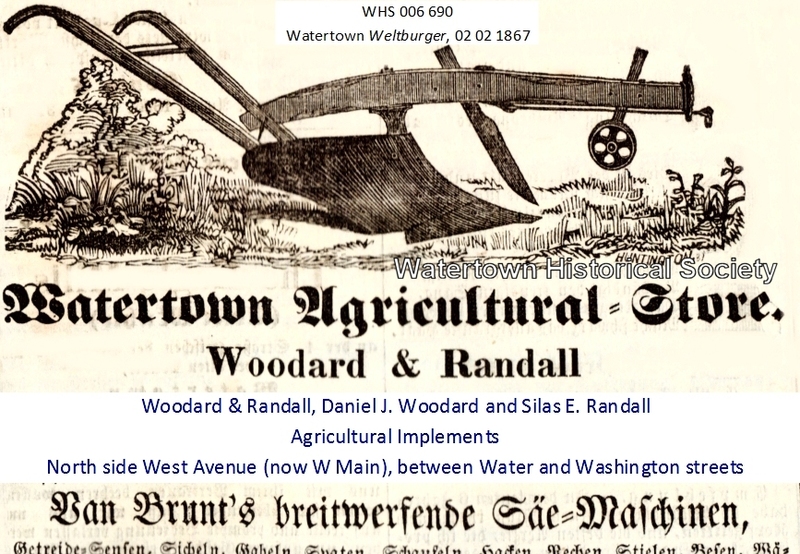 Later businesses in this location included E. W. Schultz, undertaker and furniture dealer, the Watertown School of Business, Baumann's Candy Kitchen, the Youth Activity Center (YAC), Tri-County Tobacco, Emil's Pizza, Pizza Junction, and presently Curves. Mr. Lester Moser was a highly skilled candymaker. He learned the trade at the former Baumann Candy Kitchen in West Main Street, where the Tri-County Tobacco Co. was later situated. He was an expert candymaker and confectioner. After the death of Arnold E. Baumann, Mr. Moser, who had worked for Mr. Baumann for many years, took over the business. The Baumann Candy Kitchen was for years the leading establishment of its kind in Watertown. An ice cream parlor was operated in connection with the business. In the line of fine candies, Baumann's was among the leaders in this section of the state. Its many excellent homemade candies, both hard varieties and chocolates, were among its best known products. It also turned out tons of special Christmas candies each year. These were sent far and wide to stores and shops and included many of the little German candies which at one time were so popular during the holiday season and which added color and holiday sparkle on Christmas trees and in candy dishes. 04 12 Hardly had we finished recording the departure of a venerable citizen from our midst, whose years were prolonged beyond the three-score and ten assigned by the Palmist as the rarely attained limit of human existence on earth, than we find ourselves called upon to make the melancholy announcement of the unexpected death of a young man whose career has been suddenly brought to a close before one half of that period has been reached. In this city, at the residence of Matthew Norton, on the 11th of April, 1860, James J. Dowling, of the firm of Thomas McMahon & Co., died after a short but painful illness, in the 26th year of his age. He was a young man of unblemished character. He won his position in the community by his integrity, intelligence and perseverance. His rectitude and fidelity early secured the confidence of all who knew him well. During a series of years he acted as clerk in one of our leading mercantile houses, and when he gave up his place, he carried with him the unbounded good will and best wishes of those he had faithfully served and whose interests he had looked after as carefully as he would have pursued his own. By industry, economy and strict attention to his duties he had accumulated sufficient means to enable him to commence business for himself. A three-story downtown structure located at 102 N. Water St. sustained extensive damage early Sunday when fire broke out in an apartment inside. 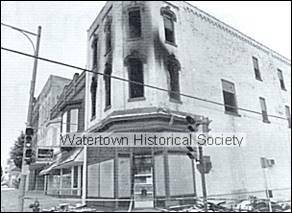 According to Watertown Fire Department Chief Richard Olson, the fire erupted at approximately 1 a.m. in the second floor apartment of the brick structure located on the northwest corner of the intersection of Main and Water streets. The three-bedroom apartment, occupied by a couple and their five children, sustained smoke, fire and water damage. The couple and two of their sons were home at the time of the fire but escaped unharmed. They are currently staying with friends. A third-floor storage area in the building sustained fire damage as well. A vacant area on the first floor sustained water damage. A firm with offices on the Water Street side of the building was not damaged. However, workers were busy attempting to restore electrical service to the business after it was cut by firefighters battling the blaze.